Horizontal cylindrical tank, single wall built in carbon steel Capacity : 2000 lt.Color: Green Ral 6011Dimensions : ø 127 / Kg. 310Dimensions containment basin : 150 x 220 x h. 30 cm. Horizontal cylindrical tank, single wall built in carbon steel Capacity : 950 lt.Color: Green RAL 6011Dimensions : ø 90 / Kg. 136Dimensions containment basin : 150 x 220 x h. 25 cm. 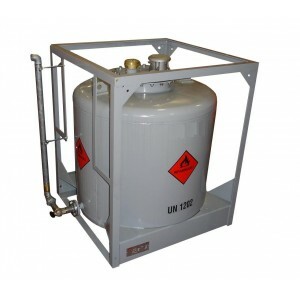 Transportable Tank - ADR approved - For Genset Feeding Capacity : 440 lt.Color: Grey RAL 7042Dimensions: 119 x 87 x h. 110 / 171 Kg. 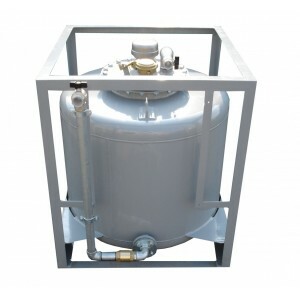 Transportable Tank - ADR approved - For Genset Feeding Capacity : 900 lt.Color: Grey RAL 7042Dimensions: 197 x 100 x h. 125 / 229 Kg. 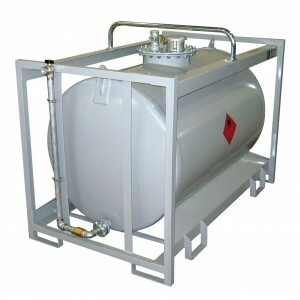 Transportable Tank - ADR approved - For Genset Feeding Capacity : 280 lt.Color: Grey RAL 7042Dimensions: 109 x 77 x h. 94 / 142 Kg.